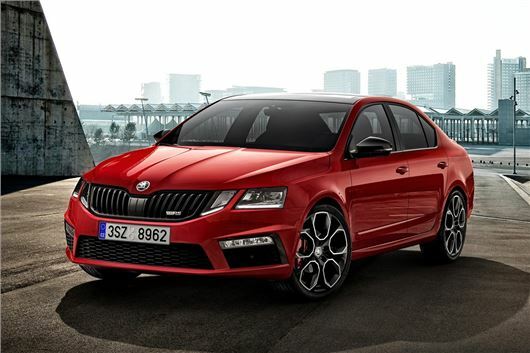 Skoda will launch another (yes another...) version of the Octavia vRS at the Geneva Motor Show. As it seemingly aims to rival the SEAT Leon Cupra with a series of ever-so-slightly more powerful models, there will be a new vRS 245. It will go on sale in the UK this summer. That's a whole 15PS more than the current top of the range Octavia vRS 230 and as with the standard vRS, it will be available as a hatch or an estate. That extra power drops the 0-62mph time a fraction - down to 6.6 seconds for the hatch (6.7 seconds for the estate) and it comes with the same limited slip differential as the vRS 230. Alongside the manual is a new seven-speed DSG automatic gearbox. Other changes include a wider track and a lower ride height - 14mm closer to the ground than before. The new facelifted vRS gets the split headlight design that was recently introduced to the Octavia range along with a wider grille. There is also a gloss black trim - rather than chrome - and black mirror caps. It comes with 19-inch alloy wheels as standard. Inside, there's the usual vRS interior with black headlining, silver aluminium pedals and Alcantara sports seats. The LED ambient cabin lighting can be changed to one of ten colours. Snazzy. It also comes with the option of an upgraded 9.2-inch Columbus navigation system.